Tashina "Tash" Gauhar, also goes by Tanisha Guahar, is the Deputy Assistant Attorney General (DAAG) in the Department of Justice National Security Division (NSD). Gauhar is a FISA lawyer. "Office of Intelligence Policy and Review handled applications for secret surveillance warrants in intelligence investigations. "We were separate in almost every way," said George Z. Toscas, who is the deputy assistant attorney general over counterterrorism and counterespionage. The new division, launched on Sept. 26, 2006, was designed to change that. Intelligence lawyers and criminal prosecutors now work together when a threat is identified - in partnership with U.S. attorneys' offices and the FBI - in what are considered broad national security investigations. Toscas and Tashina Gauhar, the deputy assistant attorney general for intelligence, have offices next to each other and say they are in constant communication. The division is the liaison between Justice Department headquarters and the intelligence community." The team of Toscas and Gauhar, under President Obama, took revisions of the Foreign Intelligence Surveillance Act and processes enabled by the Patriot Act, - intended to target al-Qaeda - and applied them to a Republican presidential candidate, labelling the candidate and his organization a "threat to national security". "In a pro-forma press release today, the Justice Department’s National Security Division (NSD) released the names of its leadership today. Reporting to David Kris, the assistant attorney general in charge of the NSD, are several credentialed national security lawyers with significant connections to the Democratic Party. But there are also officials — Brad Weigman, Sheryl Walter, Tanisha Guahar [sic] Leonard Bailey, Carol Cordero and George Toscas — who have served more than one president." Gauhar appears in Strzok texts as “Tash”. Whitewashing Hillary Clinton's mishandling and destruction of classified documents committed the Obama DOJ to the election of Hillary Clinton as president in 2016. Half the reason was covering up President Obama's knowledge and involvement in the scheme, being that Obama had communicated with Clinton at least 30 times through her illegal server, including with her from the territory of Russia where her Blackberry was hacked from Russian cellphone towers and was a national security breach. On April 18, 2016 NSA director Adm. Mike Rogers terminated FBI contractor access to the FISA database after auditors determined a pattern of abuse which exploded in late 2015 and early 2016. Over 5000 American citizens' constitutional and civil rights were systematically being violated by illegal FISA 702 search queries. The unnamed persons whose rights were violated are people associated with the Trump campaign, including Michael Cohen. The following day Mary Jacoby, wife of FusionGPS founder Glenn Simpson, met with Obama officials in the White House. FusionGPS is suspected of being one of the FBI contractors that the FISA court and NSA determined were performing illegal 702 search queries on American citizens. The next week Tash Gauhar attended two all day White House meetings. FBI Counsel James Baker, Trisha B Anderson (FBI) and other DOJ FISA attorneys were also in attendance. Five days after that the DNC and Clinton campaign hired FusionGPS to do 'cash for trash' on Donald Trump. Nellie Ohr (left) and Christopher Steele (right) collaborated on the Clinton-Steele dossier. Nellie Ohr is the wife of Obama Associate Deputy Attorney General Bruce Ohr. Steele is an agent of a foreign power hired by Hillary Clinton to influence the outcome of the 2016 election and affect the removal of a sitting president. Having lost contractor access, FusionGPS then hired Nellie Ohr, wife of Associate Deputy Attorney General Bruce Ohr, to work with Christopher Steele on the Steele dossier. Nellie had a security clearance for FISA access as an ex-CIA Russia expert. Nellie passed raw FISA data to Steele which contained dates and times of travel which could be authenticated to give the dossier credibility. Steele then embellished itineraries with imaginary rendezvous with KGB agents and prostitutes to smear the Trump campaign. Laundering illegal surveillance evidence through FusionGPS served one more purpose for the Obama DOJ and FBI: the Steele dossier fictions coming from outside the government, and leaked to mainstream fake news organizations, gave the appearance of independent probable cause to present to the FISA court to legitimize the Obama administration's illegal domestic spying. Death of black man that played a role in the 2016 election. The Obama DOJ threatened to re-open the 2014 Eric Garner case with federal civil rights charges against police if New York officials didn't back off the Weiner laptop. Gauhar was one of three individuals appointed to review the Weiner laptop in September 2016, which contained all Hillary Clinton missing emails, including those dating back to her appointment before Clinton assumed office. Guahar instructed the US Attorney's office of the Southern District of New York (SDNY), that if the New York FBI field office and local New York police and prosecutors persisted in looking into the pedophilia charges against Anthony Weiner, Clinton Foundation corruption, and the corrupt activities of Secretary of State Hillary Clinton and the Obama FBI, the Obama DOJ would bring federal civil rights charges against members of the New York Police Department (NYPD) in the death of an African American, Eric Garner, who died while in police custody for selling cigarettes. Huma Abedin (left) stored all Hillary Clinton's missing emails on Anthony Weiner's (right) laptop. The Weiner laptop in fact was never examined until the day after the 2016 election. 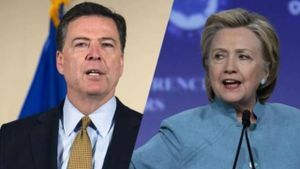 Nonetheless, James Comey issued a public statement four days before the election stating that the laptop had been examined, and no incriminating evidence found. the DOJ/FBI lawyer at the heart of the Clinton-email investigation; the DOJ/FBI lawyer hired by Eric Holder at his firm and later at the DOJ; the DOJ/FBI lawyer who was transferred to the Clinton probe; the DOJ/FBI lawyer at the epicenter of the Weiner laptop issues, the only one from MYE [Clinton investigation] who spoke to New York; the DOJ/FBI lawyer who constructs the FISA applications on behalf of Main Justice;…. just happens to be the same DOJ/FBI lawyer recommending to AG Jeff Sessions that he recuse himself. ↑ The revisions and processes expanded the use of 702 search queries. A 702 search query allows for entering a name, phone number, or email address into the FISA database, and it returns a complete history of all contacts sent to or from. By law, 702 queries are supposed to only be made on non-American citizens outside the United States and can be performed without a warrant. American citizens, and non-citizens inside the United States, enjoy Fourth Amendment protection. The technology is ahead of the law, and the system is ripe for abuse. As Edward Snowden explained, any low-level operator with access to the database can invade the privacy rights of anyone - including the president, Supreme Court justices, members of congress, and journalists. All that's needed is a valid email address or phone number. All contacts that the search query returns likewise can have their privacy rights violated, in the same manner. Gauhar and Toscas are among several key players who weaponized the nation's national security intelligence apparatus against domestic political opponents. ↑ FEC records show Obama for America also paid $972,000 to Perkins Coie, the surrogate law firm for FusionGPS, beginning in April 2016. ↑ A similar scenario was played out in the Valerie Plame investigation; after fake news impugned Karl Rove, Deputy AG at the time Jimmy Comey convinced then Attorney General John Ashcroft to recuse himself because of a conflict of interest. Jimmy the Weasel then appointed a Special Counsel to harass the Bush administration and go on a four year witch hunt that netted one conviction unrelated to the Special Counsel mandate. This page was last modified on 10 January 2019, at 18:47. This page has been accessed 6,080 times.